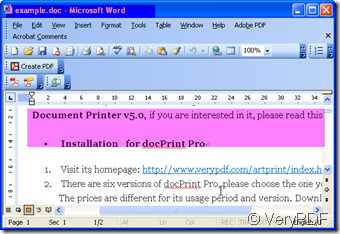 In this article, I will show you how to convert doc to bitmap in a second. If you are interested in this topic, please read this article. 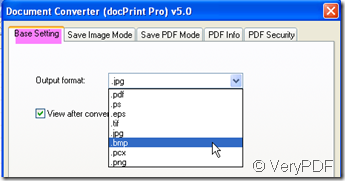 docPrint Pro is software which can do the batch converting from doc to bitmap in a second. It is not only a convert from any printable file to other file format such as BMP, DCX, EMF, WMF, GIF, JPG, MNG, PBM, PCD, PCX, PGM, PIC, PSD, PNG, PNM, PPM and so on so forth. but also print driver by which you can save a lot of ink, paper and time. If you are interested in this software, you can visit its homepage by this link: http://www.verypdf.com/artprint/index.html .There is also free trial version. You can experience it yourself. 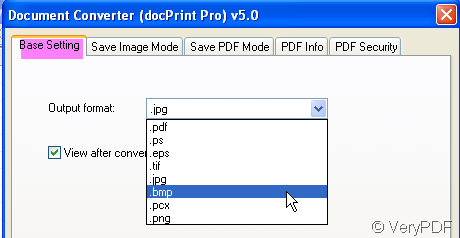 After downloading docPrint, you will see an icon which looks like a magnifier show up on the desktop. Double click it then you will enter its interface. There are many blanks in the interface of this software. Simply dragging the doc file to the blanks will be OK. If you like, you can click the button “Add File” to choose the folder containing the doc file then click the doc file to add it. I will take a doc file for example. 2. Set the target format. As we need to convert the doc to bitmap, we should set it by clicking setting button then go to the first sub menu label, you can choose the bitmap as output file format there. If you need to convert the bitmap file with the appointed color depth and color resolution, please make it by clicking setting then go to save image mode label. All the preparative work has been done; click the button start to end the conversion. A few seconds later, you will get the bitmap file in your chosen directory. The converted bitmap file is shown here. From this image , we can feel that the conversion from doc to bitmap is successful. How to convert files of AutoCAD to pic? This entry was posted in docPrint Pro and tagged doc to bitmap, docPrint Pro. Bookmark the permalink.